The list below includes the frequently asked questions (FAQs) for MYOB users. 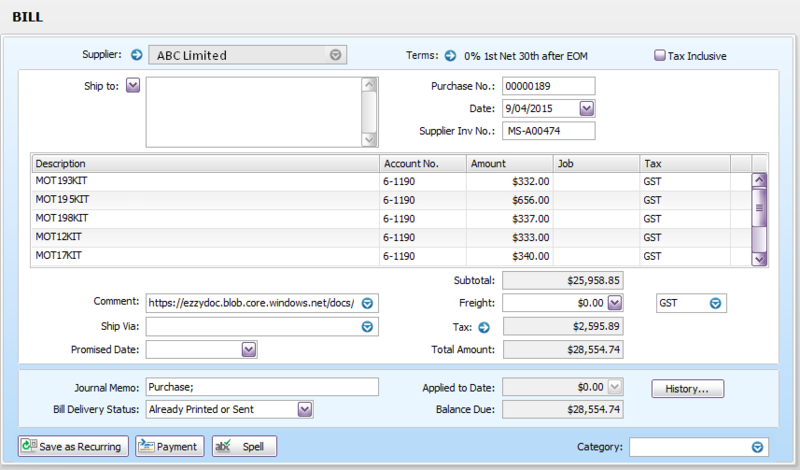 EzzyBills extracts invoice data and export them to your MYOB account. To help you further, EzzyBills provides suitable GL code, tax code and does job tracking. Check the following FAQs first if you have any questions on EzzyBills. Q1: what if the ABN number (of the Supplier) is missing on an invoice? ABN numbers are the best way to identify the correct supplier. If ABN is missing, then the invoice will get exported as an ‘UNKNOWN’ supplier (into MYOB). Q2: Who does the GL codes (Account No. in MYOB)? General Ledger (GL) codes are determined by EzzyBills based on item descriptions and how you have previously coded them for similar items. Therefore if you have a good invoice history, the whole process is automated for you. If we cannot determine the GL code (this might be the first invoice for such an item), then we will choose the default ‘expense code’. Q3: Who does the Tax Code? The exported invoice will now come through like this one below. The tax code is based on whether the item includes tax, we can determine this by analyzing the invoice data. Q4: Does EzzyBills keep a copy of the original invoice file? Yes, we do. In the screenshot picture above, next to the “Comment:” you will find a web link. This is a link to the original invoice – so at any time you can copy and paste that link into a web browser to see the original invoice. The best practice is to for your company keep the original invoice files itself for several years for tax purpose. Q5: How about the Purchase Number? Purchase Number will be automatically generated by MYOB (something like 00000189) for a new invoice without an associated Purchase Order. For an invoice with a PO, then the PO will be converted to a bill with updated information. More on converting Purchase Order to Bill. Q6: How about receipts – use Purchase or Spend Money? Q7: How to disconnect a MYOB connection with EzzyBills, and then set up a new connection to a different company? Click the “Refresh GL” button in EzzyBills User Settings (so the cache gets cleared). Q8: Does EzzyBills support stock invoices (item invoices) for MYOB users? Yes, same as for XERO users – find out more on stock invoices. Lots of things happen when you drop an invoice in EzzyBills, fortunately all you have to do is find the invoice in MYOB. If you have any further questions, check out the other User Guides for MYOB, or contact us if you need any technical assistance.